A Guide to Business Statistics offers a practical approach to statistics that covers the fundamental concepts in business and economics. The book maintains the level of rigor of a more conventional textbook in business statistics but uses a more stream­lined and intuitive approach. In short, A Guide to Business Statistics provides clarity to the typical statistics textbook cluttered with notation and formulae. 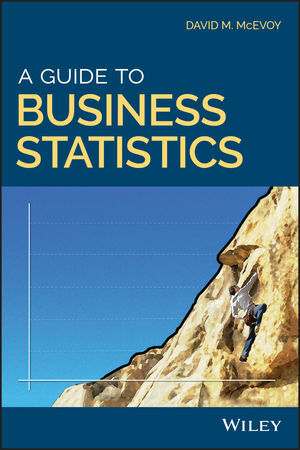 Written for undergraduate business students, business and economics majors, teachers, and practitioners, A Guide to Business Statistics offers an accessible guide to the key concepts and fundamental principles in statistics. DAVID M. MCEVOY, PHD, is an Associate Professor in the Economics Department at Appalachian State University in Boone NC. He has published over 20 peer-reviewed articles and is coeditor of two books. Dr. McEvoy is an award-winning educator who has taught undergraduate courses in business statistics for over 10 years.